Hey Love: Pop Of Pink! Hello Dolls! I hope your week is going well! Thank you guys so much for all the kind messages about my horse! She is still at the specialist but doing much better! Y'all are too sweet! We actually have a little cold front right now---which I'm excited about---because I got to pull out my blazer and boots! I wanted to "punch" my look up a little bit--so I decided to add a neon top! Perfect for Spring! Have you entered my Shabby Apple Giveaway?!! Today is the LAST day! You have until 5PM CST!! Love your blazer! You look fantastic! It's cold (okay, cool) here today too. I like the pop of pink! Here it is a rainy day. I think your whether there is better. But nice post I like the pink touch. Hope to see you soon at my blog. i like your top! it looks so comfortable! Cute look! I love the blazer and that color pink looks great on you! You are too cute and stylish Giovanna! Love this look and pink looks great on you! The pink top really brights up the look! Very cute! Love these blazer!! perfect combo with boots!! You looks so chic and comfy!!! I love your hair, what products do you use? Maybe we can follow each other? I'm following you already! You look so cute, love the glasses, my eyes are really bad but glasses don't fit me at all, luckily they do on you! I adore the glasses - such a great look! You are too cute!! Love the glasses. Hope your horse is doing better! Love the boots and blazer--very equestrian looking! Love it! love your blazer and top!!! love the glasses! Warby Parker of course! Cute outfit. yes, enjoy the cold...I doubt it will last! I love that blazer. And the pink shirt looks so silky and luxurious. I love it. Absolutely love how you add a pop of color! You are very cute. Love the colour of your Shirt. Love the blazer and neon top combo!! The smug little chic looks your giving the camera (wo)man are priceless! I need lessons! The blazer is beautiful and I love the cute boots! The neon top adds just the right amount of color too :) Great outfit. Such a fabulous look paired with the riding boots...equestrian chic hun! That pop of pink is perfect with the moody hues! omg awesome outfit! i love your style! and the glasses just perfect the whole outfit! so cute! oooooh, you pop it well! lovely! Very cute, love the blazer and boots! I love how you styled it with pink pop up tee. a lil more pink maybe? love the glasses and blazer!! they go well together! aww hun! you look like such a sweetheart! Very pretty, lady! You've got a J.Crew-esque vibe going on! I love your glasses frames! Thanks for stopping by my blog, I'm hapy to be a new follower. Nice, stylish and looks comfortable blazer! Love it! The pink really makes the difference in this look! Thnx for stopping by my blog! Maybe we can follow each other on bloglovin and gfc, I'd love to! Let me know when you follow on both so I can follow back dear! 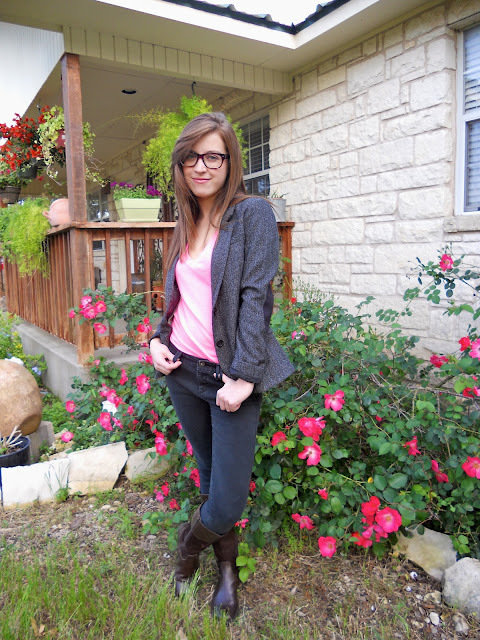 Love the pink top/grey blazer combination! I don't much care for pink, but when it's done in small doses, like this, I love it. A little bit goes a very long way! i love this pink shirt. so perfect. This is really such a lovely spring outfit...the structure/fit of that blazer is really chic, and I love the neon top for your pop of colour :) It's almost like an urban version of a British riding outfit with that blazer and boots, such fun! Great look - so simple and chic!